When planning for retirement, it is incredibly beneficial to visualize the amount your retirement savings can generate in the form of an income stream. While an annuity can create that steady, guaranteed income, figuring out the amount an annuity will pay is a challenge. Many retirement plans and accounts provide an amount of projected monthly income on each statement, based on the current balance of your account. But that isn’t a number pulled from the sky. To do so, plan sponsors and account custodians utilize an annuity calculator. 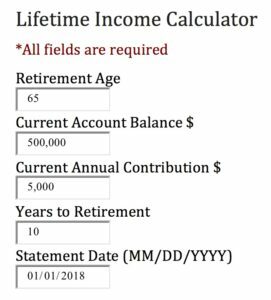 Based on this information, an annuity calculator takes into account an average rate of return on the money used to generate income, your life expectancy as male or female, and any future contributions you may add to the pot. Using an annuity calculator to estimate monthly income in retirement for you, your spouse, or jointly can be helpful in planning for the future. It is important to recognize that annuity calculator estimates are just that, and they do not represent a guarantee. Monthly income streams offered by annuities may change as your account balance fluctuations and as internal calculations shift, but annuity calculators do provide an idea of what you might receive as income in retirement.